The reality is, that as we move closer to the November elections and the Democrats see their grip on the system slip away, that we can expect them to pillage the government. They will make our tax money available to individuals or corporations that are closely tied to them personally, they will pass Progressive legislation or Executive Orders that harm free market business, and ramp up ideological warfare just to create angst in America. Like a little brat who got beat at basketball on the playground, they will stab the ball, push over the bench, and call the other kids names. 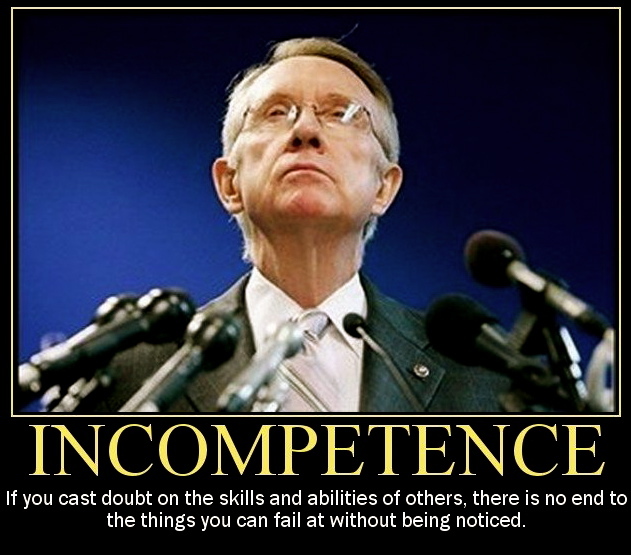 Case in point: Harry Reid… Throwing ‘hollow’ rocks at Romney over not releasing tax returns despite all of the tax cheats on the left within this administration, provides assistance to Chinese solar firm that is represented by his own son, and refuses to present any legislation to the Democratic Senate for jobs growth or economic improvement that comes out of the Republican House. This, folks, is how a government is corrupted and why our Congress is so poorly respected that its job approval rating is closing in on single digit approval ratings again. It is NOT the TEA Party or Republicans who are guilty of cronyism and corporatism this time… But does anyone on the left care to admit that they have elected the wrong people? People on the right admitted that we did a few years ago… and that is how the TEA Party Movement was started. Now we are eliminating corruption from the right, stopping crony politics, and passing legislation that will help get our nation on the right track agin. We need partners from the left who are willing to work for the nation, not for their own personal interests. Elect the people who care about the country, not the ones who care about special interests close to home. This entry was posted in Corruption, Current Issues, Government, Government Waste, Leadership and tagged Congress, Democrats/Liberals, Government Waste, Harry Reid, Progressives, Tea Party Movement. Bookmark the permalink. I’ll tell you that I am worried that if the election is close in some of the swing states, Team Obama will try to steal the election. Oh no doubt, Jim! I live in Florida… I am experiencing the controversy firsthand with our governor working to purge our voter rolls of illegals and ineligble voters. Just today there was a story out of Miami area where a woman was collecting absentee ballots illegally… apparently she was even signing them and/or filling them out for people who were in a vegetative state. Granted this was for a local election at this point but she was working closely for a Democratic Party candidate… how many of these folks will be doing the same thing for the national election? Thanks for hanging with me, Jim… I am starting the presses up, albeit slowly, again. Yeah, it’s going to be interesting, that’s for certain. There will be plenty of things to consider as the election approaches. And no question, plenty to write about over the next 5 months. Thanks for stopping by Matt!